Did we just blow your mind? Let us quickly back it up with some facts: In Chapter 16 of Harry Potter and the Deathly Hallows, Harry and Hermione visit Godric's Hollow and find a memorial to the late Lily and James, stating that they died in 1981. Now, we all know that was on Halloween night, October 31 — and that Harry was one year old at the time, having been born the previous July 31. Meaning he was born on this day, in 1980. It's a little confusing, because this means that the books were written after the facts they described actually happened. And, understandably, many of us who are not currently 33 felt like we were growing up with the books as we read them. 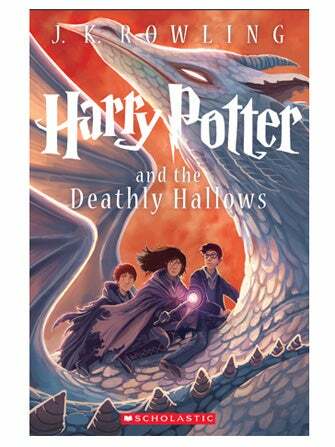 As a gift, he's getting this brand new cover for The Deathly Hallows, created by Kazu Kibuishi. Anyways, happy birthday, Harry, symbol of eternal youth and innocence and goodness. Hope you're doing okay with your normal, post-Voldemort life, rather than having some kind of mental breakdown because you don't know what to live for when there isn't a perfectly-timed battle at the end of every school year.